Black's last move was Rad8 (?) Adam now missed the best reply, both on his next move and the move after that. Although Adam went on to win after 57 moves, he could have probably forced his opponent to resign if he had found the best move. Can you see it? Incidentally, after that first round loss, GM Sengupta went on to score 7/9 and share first place with Chinese IM Yiping Lou. This is a classic interference idea. Nd5 + wins the exchange for if the pawn takes the upstart knight then the support for the Black rook on D2 is destroyed and of course any Rook taking the Knight will be taken by the e4 pawn. 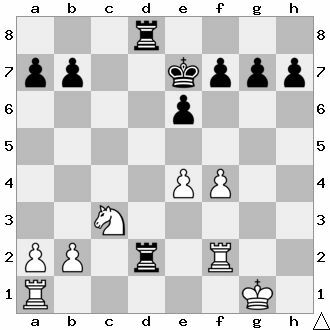 For completeness moving the king anywhere out of check also loses the D2 rook. I'm sorry, but I must disagree. Being shown a position and knowing that there is "a tactic" to be found is a completely different proposition to finding such a move over the board in the middle of a competitive game. It just goes to show how many moves the brains of even top players automatically disguard in the heat of battle, when in fact they can seem unfairly obvious when presented in isolation and out of context. Good comments by David and a good reply by Adam.